Physician assistants can play a key role in treating patients with diabetes through an interdisciplinary approach that includes medication therapy management. Those who manage glycemic control through medication compliance can reduce their risk of diabetic retinopathy. Evidence has shown that pharmacist-managed diabetes clinics can offer positive outcomes related to diabetes quality measures.4 Pharmacists can educate patients about comprehensive eye exams as part of their diabetes management and refer individuals to an ophthalmologist or an optometrist. Follow-up calls and pharmacist consults in the community setting may increase patient compliance with eye exams. As part of some pharmacy programs, students are trained in physical assessment, which includes basic eye exam principles and specialist referral education. Physical assessment courses are also offered as continuing education certificate programs that include identifying signs and symptoms of diabetic retinopathy. National Eye Institute. Facts about diabetic eye disease. nei.nih.gov/health/diabetic/retinopathy. Updated September 2015. Accessed August 17, 2018. Mayo Clinic. 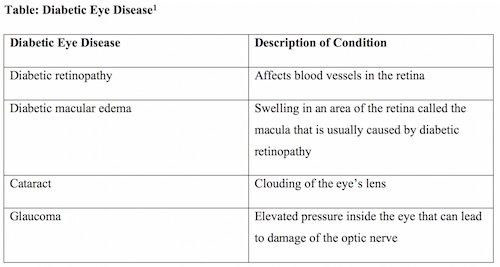 Diabetic retinopathy. mayoclinic.org/diseases-conditions/diabetic-retinopathy/symptoms-causes/syc-20371611. Published May 30, 2018. Accessed August 17, 2018. Aneese NJ, Halalau A, Muench S, Shelden D, Fett J, Lauster C. Impact of a pharmacist-managed diabetes clinic on quality measures. Am J Manag Care. 2018;24(4 Spec No. ):SP116-SP119.